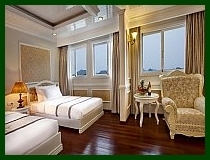 07:45 – 08:15 Your transfer vehicle will collect you from your hotel in Hanoi and convey you to Halong City. 12.00 Embark at Vinashin habor. 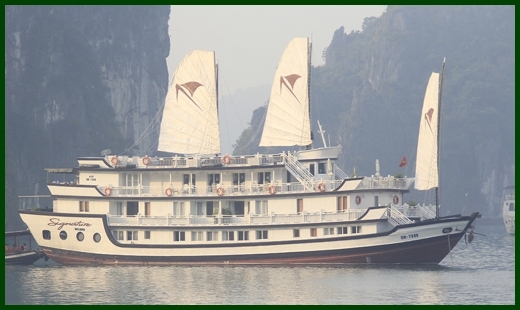 You will be taken on our excursion boat from the wharf and make your way out onto the bay to board our luxurious craft, Signature Halong Cruise. 15:00 After lunch we set sail for Bai Tu Long Bay passing the towns of Hon Gai and Cam Pha, extraordinary limestone karst landscapes, Oan Lagoon, Teapot and Monster Head Islets. Explore Vung Vieng fishing village by local rowing boats or kayaks to discover the interesting daily lives of its inhabitants. 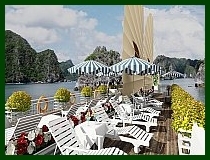 Signature Halong Cruise will stay close to Hang Trong Islet for the evening. 19:00 Dinner tonight is a scrumptious a la carte delight with a range of different options guaranteed to please everyone’s palette. 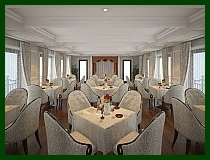 07:00 Enjoy our buffet breakfast. 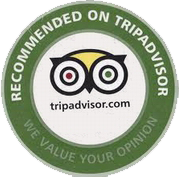 It is one of the best, if not the best in the region and our guests are always satisfied. We provide a wide variety of breakfast favorites and we are sure there will be something for you no matter what your preference is. 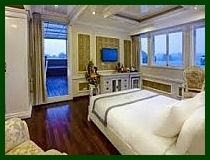 08:30 After breakfast we board the excursion boat for a side trip to Surprise Cave (Sung Sot). The 100 stair climb is well worth the extraordinary views this grotto worn over millions of years into a lime stone karst. 10:00 Back on board it is time to check out of your cabin as we draw closer to the mainland. After a final early lunch and a last goodbye from our crew, you will board our excursion boat and head back to the wharf where you will be met by your return trip vehicle to transfer you to Hanoi. On behalf of the Captain and crew, we sincerely hope that you enjoyed your trip with Signature Halong Cruise and we look forward to your return journey.